Published January 7, 2016 at 540 × 960 in . Bella was abandoned around October pregnant and all alone, she was taken in to care by a foster where she began receiving the nutrition and care she needed the owner after abandoning the dog for two week showed up to claim Bella. When the foster refused to return the dog cops where called in. 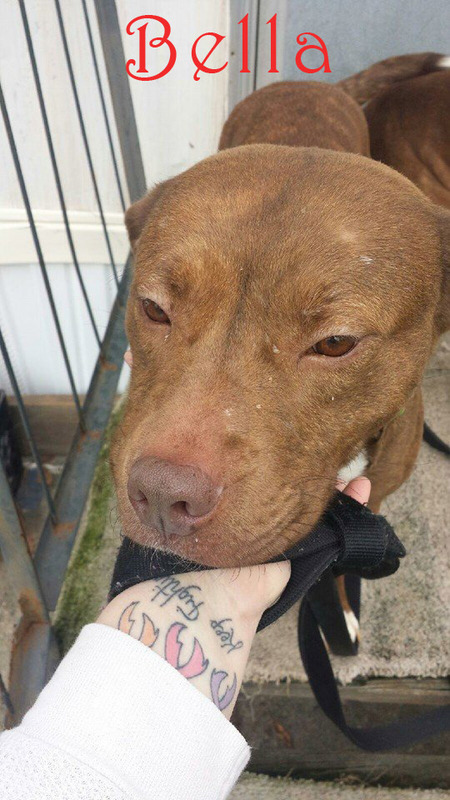 The cops allowed Bella to stay with the foster but the next day cops where again called. The fosters were forced to turn Bella over. Bella was placed in a vacant trailer with no power till Bella gave birth. After a weekend and a half and all puppies were believed to be dead the owner returned to the fosters asking to surrender dog. One pup was found alive under a neighboring trailer with one pup alive. Upon calling Bully 4 You and other PAWS too mom and pup were rushed to vet where it was established the pup would not make it do to malnutrition since mom was not producing milk, and pneumonia had shut his body down. A month later mom was fixed and given rabies vaccination. Mom is ready for adoption now.